A slot machine is a gambling machine with at least 3 reels (classic slot machines) that spin after the player presses a button. Most modern video slots contain 5 spinning reels or more. The aim of the game is to get a winning combination out of symbols on the reels and get paid. Slot machines may be also called one-armed bandits (the first machines had levers instead of buttons), fruit machines and poker machines. IIn addition to buttons lots of modern slot machines have levers which in fact are used for decoration. Today slots are one of the most popular casino games and are a big part of land and Internet casino income. According to statistics, more than 70% of Internet casino revenue and more than 80% of land casino income is generated from slot machine games. All slots machines are based on a RNG (random number generator) which means that the game results are totally random and can't be predicted. To operate slot machine the players use a set number of options. As a rule, most slots, no matter the number of reels and paylines, use the same options and buttons. 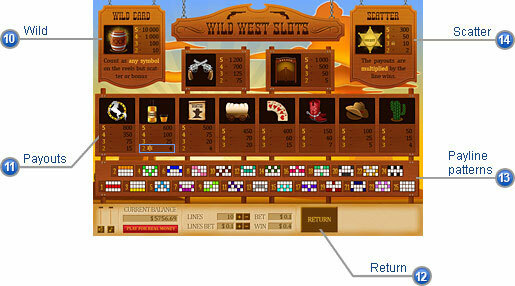 Let's study them by an example of a 5-reel video Wild West slot game. Payline indicators - special indicators which show on which paylines the player bets and in case of win they show the winning paylines. By clicking on each indicator the player can choose the total number of paylines. The Payline wins - when the combination on the reels wins, a corresponding indicator is activated and the player can see according to which payline he is paid out. In this example the player is paid out for getting a combination of 2 symbols according to the 1st payline To be winning any combination there MUST have at least two identical symbols one after another, and the first one MUST occur on the first reel. Number of paylines (Lines) - to choose the number of paylines to bet on, the player can use the "+/- Lines" buttons in the game menu. Balance - a special window which shows the current money balance of the player which changes after each win or loss. Lines Bet - the buttons allowing to select the coin denomination. The player can increase the coin denomination by clicking "+" button or decrease it with the "-" button. Bet/Win - payout meter which shows the size of the current bet and payout after each win. Paytable - this button allows the player to switch between the game and the paytable which explains the symbols, paylines, and payouts. Spin - by clicking on the "Spin" button the player activates the slot game and the reels start spinning. Bet Max - a special button which allows the player to make the maximum bet and activates the game automatically. Wild - the slots symbol which can count as any other symbol to create a winning combination but scatter or bonus symbols. Wild is sometimes called the Substitute symbol. Payouts - the number of coins paid out for each winning combination. The total amount of winnings is the number of coins multiplied by the coin denomination selected by the player. For example, if the player bet $0.10 on the 1st payline and wins he is paid out $0.40 because there are two matching symbols in the combination which pay 4 coins (see the paytable). Thus the payout is $0.10*4=$0.40. Return - - a button which allows the player to switch from the paytable back to the game window. Payline patterns - patterns with straight or zigzagged lines of slot symbols that create the game paylines. Scatter - a special symbol on the reels which is used to create combinations which pay out jackpots, or any of the bonuses or multiplies the winnings. 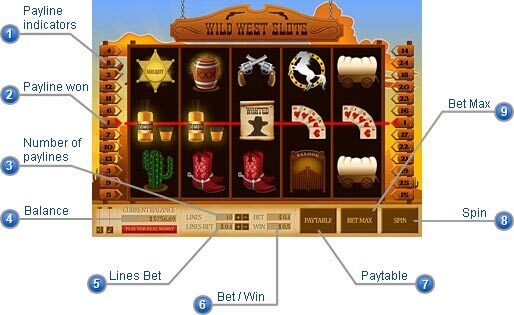 NB: Above we have described the buttons and features of an online slot game created by SlotsDoc.com. If you choose to play slot games provided by a different software, the arrangement of the buttons may vary. Also, some slot machines have extra buttons such as Autoplay, Bet One and Coins. Autoplay option allows players to set the slot machine reels spinning automatically according to preset parameters. Bet One button is used by the player if he wants to bet the minimum amount for the next spin. This option is opposite to the Bet Max. Coins - in some slot games the player can bet several coins on each payline and in such case he is offered to choose the number of coins. If you play at a slot machine in a real casino, the names of the buttons can be different. The button used to bet the maximum amount may be called Bet Max Credits (or Bet 2 Credits, Bet 3 Credits, etc. ), the Bet One button case is called Bet One Credit. There could also be such option as Cash Out which allows to get the payouts from the machines that do not pay out after every win. Some of the slot machines installed in real casinos have levers in addition to the Spin button. 1. Choose the slot machine you prefer (classic, video, progressive, or bonus slots). 2. Select the number of paylines if you are playing multi-line slots. 3. Choose the coin denomination and place your bet. 4. Press the Spin or Bet Max button to activate the slot machine. 5. Check the paytable after the reels stop spinning. The aim of the game is, of course, to win money from the machine. The game checks matching symbols on the reels that have stopped. These symbols are usually of bright colors and can be easily recognized. Most of the time, the symbols are fruits, numbers or letters, or simple shapes like bells, hearts or spades. Modern slot machines have symbols like cartoon and movie characters and so on. If you want to try themed slots, use the slots directory where we have grouped all slots together according different themes. If you wish to master slots and learn more about slot machine games visit our slots rules page. Looking for online themed slot games? We have grouped all slots according to the most popular themes offered by software providers. Slot games based on different themes use various symbols, original design, sounds and bonuses. See all the themed slots and use the slots directory to choose the game you really like.